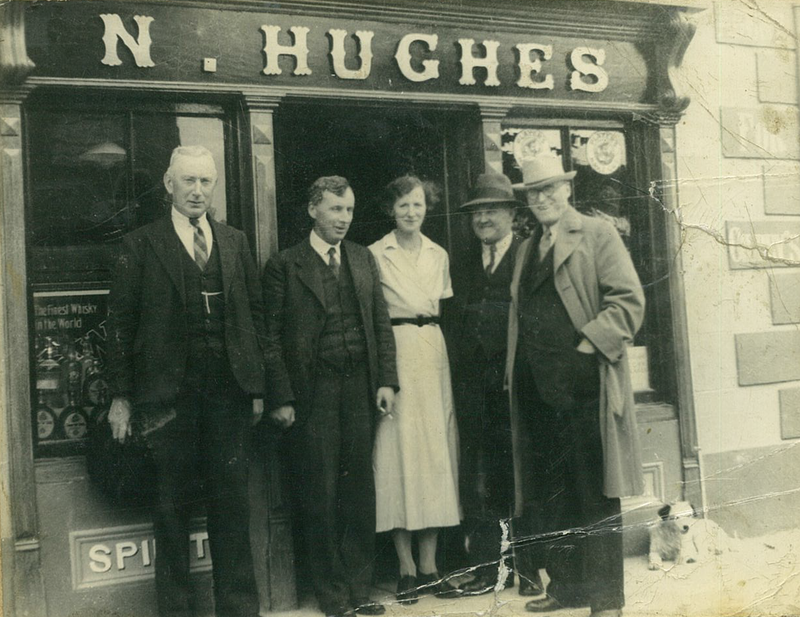 Nicholas Hughes (2nd from right) outside his pub in Ballygar. It was here that Briscoe stayed when he was sent by Collins to Ballygar in early 1920. 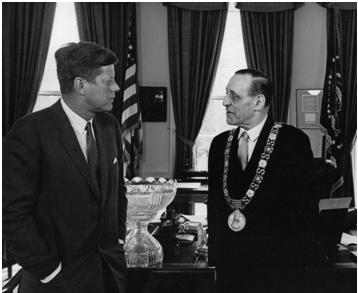 Robert Briscoe and John F. Kennedy in the White House during a diplomatic meeting in 1962. Briscoe was Lord Mayor of Dublin at this time. 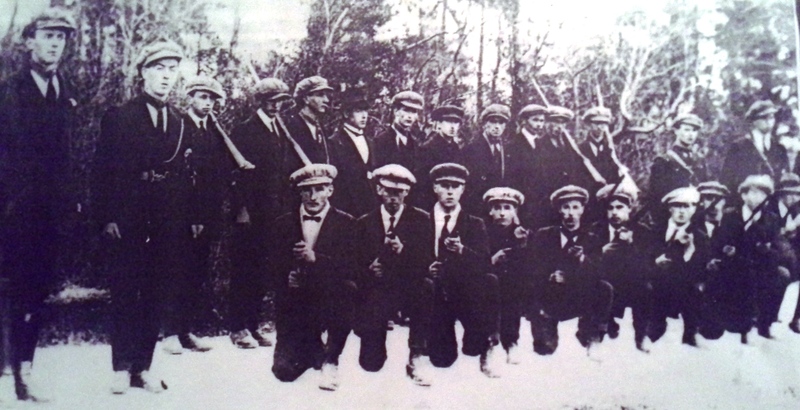 By early 1920 the Volunteers supply of arms and ammunition was running very low both locally and nationally. Sinn Féin member Robert Briscoe was asked by Michael Collins to go to Germany and secure a supply of weapons from the defeated German armies who had hidden vast quantities of weaponry from the allies in arms dumps around the country. Briscoe managed to get a large consignment of arms and ammunition sent to Ireland on merchant ships. When he returned, Collins sent him around the country to find out what weaponry was needed within the various Brigades. Collins stated that he especially wanted information on the arms situation within the Galway Brigade and he arranged for Briscoe to meet the Brigade in Ballygar. He gave Briscoe a dispatch to give to the O/C of the Brigade and Briscoe was very worried about this being discovered by the authorities on the way down from Dublin. His wife Lily came up with an ingenious but simple plan; “we’ll hide it in Joan’s diaper”, she told her husband. Joan was their infant baby. They were searched on the way down on the train, one soldier held the baby while two others searched both parents. The plan worked brilliantly and the soldiers moved on. They got a taxi from Ballinasloe to Ballygar and were stopped a number of times by soldiers and police but managed to get safely to Ballygar. They went immediately, as arranged by Collins, to a business in the middle of town where they were warmly welcomed by the business owner Nicholas Hughes . Hughes told Briscoe to visit the local chemist shop to buy toothpaste; he didn’t argue and when he arrived at the chemist and asked for toothpaste he was told by the shop attendant that ‘the Brigadier and the flying column will be here at 12 O’clock.’ The parish priest, Rev. Dr. Kielty, was an active member of the local Sinn Féin club and he called to see Briscoe when he heard of his arrival. He was worried that the police might want to question Briscoe so he went down the street to the RIC barracks and ‘pounded on the door, and through the open window we could hear him complaining at the top of his voice, ‘people are stealing my turf…ye are not protecting and minding the people’, we could hear the constables trying to pacify him.’ Rev. Kielty’s protests seem to have worked as the police remained in barracks during that day and night and did not approach Briscoe. That night he made his way to a bakery in town and met the local Brigade including the man that had served him in the chemist. The Brigadier and staff told Briscoe what weaponry and ammunition they had and what they required. Briscoe then handed over the dispatch sent by Collins and returned to Nicholas Hughes’s house but was awakened during the night to the sound of explosions and gun fire. The local battalion were diverting attention away from Ballygar by blowing up various targets around the area. A relieved Robert Briscoe and his family returned to Dublin by train the next day.